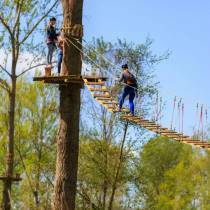 Fun Forest Almere is the biggest climbing forest featuring the most and also longest ropeways in The Netherlands. A day spent out here means a day full of fun, action and adventure. There are five different climbing courses, each with its own height and grade of difficulty. Beginners and advanced climbers alike will find their challenges here. That’s why this climbing forest is the perfect excursion for many different groups, from a kids party or a family day to school trips, bachelor parties or company excursions. 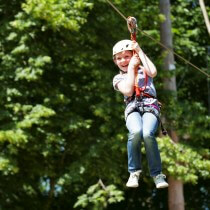 You’ll move through the climbing courses by means of ropes, bridges and ropeways, right through the trees. Depending on the course you take, your climbing height varies between 1.30 and 18 metres. Near each course there is an info sign, clearly visible, telling you what your minimum body height should be and if extra instruction is needed. On one of these courses you can even climb for 30 to 45 minutes, non-stop! Specifically for kids between 8 and 11 years the monkey course was created. It is 4 metres high and forbidden for adult climbers. Fun Forest reserves the right to modify / amend the opening hours. The park will often be closed earlier on a quiet day. It is therefore advisable always to book online to ensure a climbing place. Once night climb? On Saturday, October 29th, you can climb in the dark during the Night of the Night. If you would rather go for a little more exciting, come on Friday, October 28th during the Halloween Night Climb! 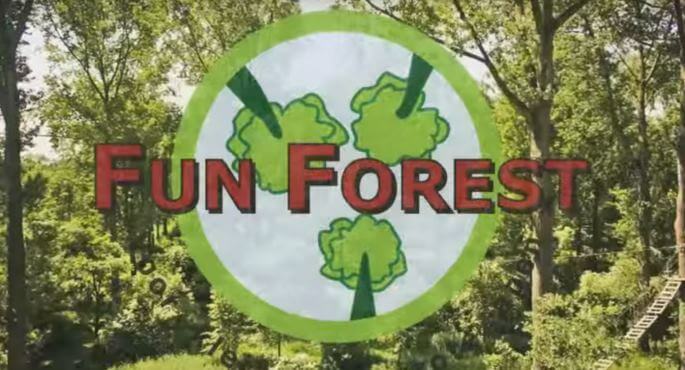 Fun Forest Almere is the perfect day out for your entire family. 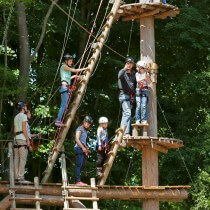 The youngest can live themselves out for an hour and a half on the monkey course. The bigger ones, 12 years and older, can have their fun independently for 3 hours on the regular climbing courses. Kids between 8 and 11 years can also climb on the regular courses, provided they are accompanied by adults: One adult for every two kids must be with them. Spend the day here at the climbing forest with your family and you’ll enjoy the most active fun day you could possibly have in The Netherlands! Special kid parties can be organised here! Bring along your friends and have a great party at the Fun Forest. Your choices are: The Monkey Fun climbing party, the Banana climbing party or the Forest Kids Adventure. Search for bananas while climbing and crack the code of the treasure chest! You’d rather do something else than climbing? Then the Forest Kids Adventure is for you. Build things together, from wood and rope. Do some sports competitions or a set of brain games. Looking to organise an active school trip or a company excursion? That is possible here, too! Here in the forest you can climb for 3 hours, on various courses. And besides climbing, several team building activities can be organised here at the Fun Forest, tailored to your needs and interests, for kids as well as for adults. Preceded or followed by a wonderful lunch, dinner, barbecue or aperitif. Want to get a first impression of what to expect from such a climbing day? See our film here below and right afterwards, book your own action day! Also, have a look at our arrangements for kid parties, school trips, company excursions or bachelor parties.